As we previously mentioned, Chris Jeanneret announced a couple weeks ago that he will be piloting a Turbocharged K24 powered Honda S2000 built by SpeedFactory Racing. So without further abdue we’ll just let Chris explain what he has in store. Earlier today it was announced that Kenneth Moen will be joining the current Achilles Radial & Bridges Racing for the 2014 season alongside their current roster of Daigo Saito, Robbie Nishida, and Dean Kearney. This is big news for Moen as he was seen in a borrowed car at Irwindale to end the 2013 season after, rumor has it, Lutz Performance ran out of funding and pulled out of Formula D and possibly closed it’s doors. Kenny will be piloting a new car built by San Bruno California based shop Limitless Motorsports. They will be building him a 2JZ powered Nissan 240sx s14 chassis expected to put out around 700hp. Kenneth performed pretty well in a Z chassis last season that was pushing it’s life well past it’s use so it should be a great season for him in a new chassis with proper support. 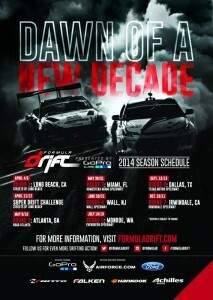 Formula D Round 3 Heads to Miami! It’s been a topic in the paddock for a while now about the dislike of Palm Beach International Raceways makeshift drift course and it’s disconnect from any major population as it’s hosted the last three, and only, events for Formula D in Florida. It was first noticed at the official Formula D 2014 season press release, held at SEMA, that Round 3 only mentioned Florida and not PBIR or a city, we now know that city and track! 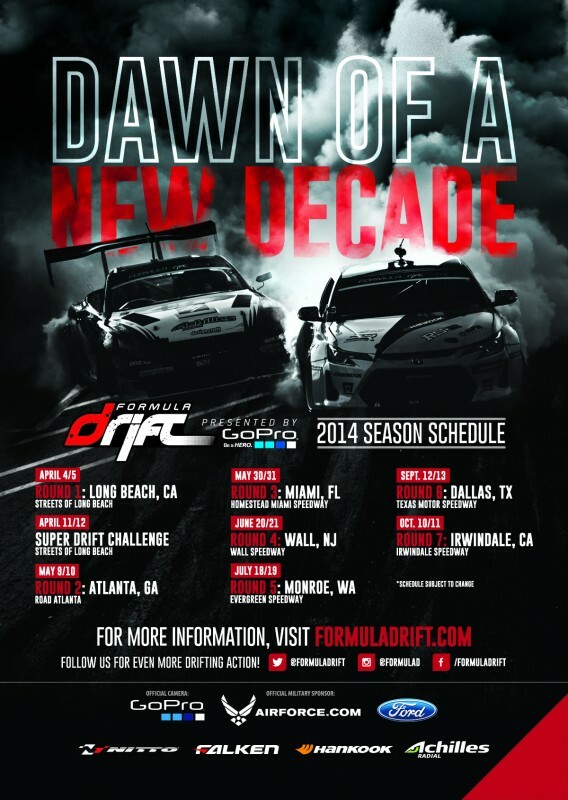 Formula D released the first advertisement for the 2014 season and it lists Miami, Fl’s Homestead-Miami Speedway! Hopefully this venue has a much better setup and reception from the drivers than PBIR did. Drift Idiot brings the lawls today releasing Drift Day 11 featuring Bazookas, Bugatti’s, and Burnouts. With the help of Corey Hosford and his epic mustache, Sam Nalven gets some help and a big of practice back behind the wheel after a 7 month hiatus.